...After intermission came Pyotr Ilyich Tchaikovsky’s Symphony No. 6 (“Pathétique”). The piece was an ear-opener in that Jackson led the ASO in a performance that was in no way rote, but a very personal, insightful and empowered rendering of this well-known work, one which kept hold of the listener’s attention. It was clear that Jackson knew exactly what she wanted from the orchestra, and the performance demonstrated just how far she has come as an assured conductor since her time as an ASO assistant conductor and conducting fellow. Guest conductor Laura Jackson, who served as the ASO’s assistant conductor from 2004 to 2007, began the evening with the first suite from “Ancient Airs and Dances” by Ottorino Respighi. This proved a perfect setup for Avital’s performance, as the composition begins in a pleasant Baroque format, only to expand to reveal a rich Romantic depth. Jackson, an expressive, demonstrative conductor, nearly danced along with the orchestra during the second movement, a galliard. Her obvious enthusiasm for the music translated to the orchestra, which performed with a restrained brilliance. In one particularly notable section, cellist Daniel Laufer played a solo passage that showcased his caramel resonance and bell-tone clarity. On the face of it, the grand Symphony No. 6 by Pyotr Ilyich Tchaikovsky seemed an odd choice to close the program. The soaring romantic writing, with strings that sing out and sing loud, is another world away from the Vivaldi. In the superlative performance, masterfully conducted by Jackson, the most striking section of music occurred not in the raucous third movement but in the finale. Led by the violins, the ASO string section produced a series of disembodied, seesaw chords — a thick lather of dissonance, the music pushed back and forth like a ship on a tossing, churning sea. After the crowd-pleasing third movement, the subdued fourth could feel like a letdown, but instead was a fitting coda for the evening." As conductor Laura Jackson conducted the Wintergreen Music Festival Orchestra the other night in the "Three Sky Interludes" from Amelia, my 2010 opera for the Seattle Opera, there were several times when she cued the players with what shall have been for a boxer a lethal uppercut. Wiry, and as precise in her movements as a boxer, she was as accurate as a surgeon; the musicians under her baton responded with enthusiasm to her beat's clear precision. Wielding the baton sometimes like a rapier before the massive sound that I had called for, and sometimes like a matador's cape, she coordinated and shaped the combined efforts of an all-star orchestra comprised of professionals from orchestras all over the country. She did it on 36 hours' notice, at fellow conductor and festival artistic director Erin Freeman's invitation, filling in for a conductor unable to appear. When the players then went into the ring with the Beethoven Fifth Symphony, I felt as though my heart would break. The terror of those opening bars, the music sounding so like fists crashing on a closed door, visceral in the extreme; my seven year old son, attentive, tucked under my arm, had never heard the piece before. His eyes shon as he whispered to me, "Papa, did you write that?" Beethoven wrote it, I told him. He'd been brought back to life by the men and women we had gotten to know and make music with during the past two weeks at the music festival. "Why?" asked my son. He wants to talk to us, I replied. He wants us to share his feelings, the things that were best about him. Listen, I told him, and, if you're ready to hear what Beethoven has to say, you'll hear him. It's been said that nothing keeps an orchestra sharper than touring or playing under a guest conductor. For the Sacramento Philharmonic, both were in play Sunday afternoon at the Mondavi Center. The program it tackled was an interesting one: an engaging world premiere for violin and cello by composer Daron Aric Hagen, and Hector Berlioz's "Symphonie Fantastique." And it performed under the baton of guest conductor and rising star Laura Jackson. Under Jackson, the orchestra showed it is open to new approaches. Jackson, who recently finished a three-year stint as assistant conductor of the Atlanta Symphony. Jackson proved why she's on the short list as a candidate for new conductor at several orchestras, including the Berkeley Symphony. She's a deeply grounded, no-nonsense and intuitive conductor. Jackson led the orchestra in a tactile performance of Hagen's world premiere of his concerto for violin, cello and orchestra, "Masquerade. "Conductor Jackson was willing to let the music bloom, her conducting style crisp and efficient, yet filled with bursts of controlled emotional cues. This conducting style deeply impacted Berlioz's hyper-intense "Fantastique," possibly the most vivid example of program music ever written. This music is all about fleshing out human ardor and fervor. Jackson kept the orchestra on an even keel throughout Berlioz's large-canvas work. The performance wasn't always a dynamic or spotless affair. Some of the fire and brimstone demanded in Berlioz's work was delivered in guarded fashion, especially in some entrances. But as affairs go, it was consistently delivered. More important, it was interesting musical storytelling, with a strong bond between orchestra and conductor. The highlight of the evening was the orchestra's playing of the final movement "Songe d'une nuit." This movement is a dark and witty musical ride, and Jackson drew the right musical audacity from the orchestra, especially horns and winds. Laura Jackson, who recently finished a term as Assistant Conductor and American Conducting Fellow with the Atlanta Symphony, conducted the Moravec and Higdon works. She led with authority but no unnecessary stage antics. And in the Higdon work, she helped galvanize an obviously committed performance into an exuberant display of fresh, distinguished writing. More than any conductor heard this season in Symphony Hall, Laura Jackson has an ear for detail. Thursday evening the Atlanta Symphony Orchestra's assistant conductor delivered a thrilling performance of Brahms' Symphony No. 4. Her conception of this familiar music revealed all the important elements and left nothing out. It bristled with life while creating a compact, clenched-fist sense of logic and purpose. Despite this determination, or because of it, Jackson didn't coax a warm sound from the ASO. The strings sounded especially steely. But she had the musicians playing on full alert, which, of course, kept the audience rapt and, at the end, roaring its approval. 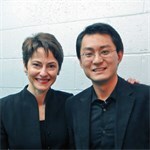 Jackson, now in her late 30s, came to the ASO three years ago as part of a national conducting fellowship program. Her term with the ASO expires after this summer's concerts. In each movement of the Brahms, she delivered a massive payoff. She expertly weighed the counterpoint, held back the crescendos just long enough to make the climaxes seem inevitable, and--an impossible combination--let the bittersweet lyricism flow with both charm and angst. And yet Jackson seems an ego-free maestra. A petite woman of crisp, well-rehearsed gestures, her Brahms was of the "objective" school. You felt the performance was the printed score come to life rather than one woman's impassioned take on Brahms in E minor. Is there a trick to composing a Hollywood hit? Almost all the scores heard on a program of familiar movie soundtracks Saturday evening in Symphony Hall followed a pattern. You start with a big tune--a bold, martial, sweeping, Roman Empire-in-outer-space sort of tune--and pad it with surging brass and swooning violins. That's it, you're done. If your tune sticks in the ear, and the picture pulls down enough box office, you might have a silver screen classic on your hands. Not every Hollywood soundtrack follows this oversimplified recipe, of course, but the Atlanta Symphony Orchestra and conducting fellow Laura Jackson, in their very appealing 70-minute survey, picked music that met this minimal standard of memorability. Composer John Williams is the model here. Linked with the films, Williams' genius is for creating potent pieces of music that are almost jingoistic in the way they stir our cultural patriotism. Despite their exotic locales and foreign (or alien) personnel, "Raiders of the Lost Ark" and "Star Wars," heard as symphonic suites, whip up a mood of cultural invincibility. Decades after the original movies premiered, this music defines America of the late 20th century; no piece of concert-hall classical music from the same era comes even close. Throughout Saturday's concert, the music was accompanied by publicity stills from each film, projected onto three large screens hung over the stage--E.T. craning his neck like a turtle without a shell, backed by another Williams score, equally famous but sappier; Johnny Depp in mascara and pretty-boy glam for "Pirates of the Caribbean," with Klaus Badelt's epic, intricate music; the staccato'd theme to "Mission: Impossible" by Lalo Schifrin; the lounge-lizard cool of Henry Mancini's "Pink Panther." Jackson conducted everything with heightened passion, often delivering more punch and verve than on the original soundtrack.